The Walking Dead season 8 episode 5 review: Is Gabriel infected? The premiere of The Walking Dead left us with an unlikely pairing of Gabriel and Negan as they were trapped in a room together while walkers swarmed. They were safe for now (well as safe as you can be trapped in a room with Negan), but we have been waiting for a long time to see what happens with these two. We don’t expect Gabriel to get through to Negan (or vice versa), but what we are hoping for is to learn more about both characters through their conversation. Rick and Daryl gets some misinformation about Carol and Ezekiel being dead and have to figure out what to do now that they no longer have the Kingdom behind them. Daryl wants to take the dynamite that they have from the ammunition truck and blow open the sanctuary doors and let the walkers flood in, but Rick doesn’t want innocent families to die. This leads to Rick and Daryl having a straight up fist fight… that is until they see the truck of guns on fire…. and subsequently explode losing all of the guns and ammo they’ve just spent 5 episodes trying to get to. Idiots. This leaves Daryl and Rick at complete odds and they end up going off in different directions. The one thing that was a standout moment was Rick seeing that helicopter!!!! If you were thinking that Negan was going to kill Gabriel right away you would be wrong in thinking that way (even tho that seems like something he might do). Negan sees people as a resource and talking to Gabriel and getting information would prove way more useful to Negan then just killing him. Gabriel on the other hand sees this situation with Negan as something completely different – he thinks that he was brought here to take Negan’s confession. Negan of course thinks he has nothing to confess and instead arrogantly claims that he is just like Gabriel in that he not only helps people, but that without him they will all die. Negan claims that he makes people strong and that his new special project is to make Gabriel strong, to which he responds by saying that he’s already strong and has killed people. As the walkers push in harder on them, Gabriel tries to push the urgency of Negan’s confession by focusing on his people, his wives, his workers and in a rare moment of reflection from Negan, he lets his guard down and Gabriel is able to take his gun from him and lock himself in another room. This is where we wonder if Gabriel really made the right choice here – the other option would be to continue to break Negan down, continue to build a trust between them and actually have them work together to get out of this situation alive, because they need each other to make that happen. It seems that Negan has the same idea as he tries to tell Gabriel that if they are going to get out of this situation they need each other. Gabriel agrees to work with him, but only if Negan confesses and he starts by his own confession of what he did to his congregation. Negan talks about his first wife (as he said his only real wife), saying he lied to her and cheated on her while she was sick and when she died he couldn’t put her down – he was weak and cowardly. It’s enough to make Gabriel open the door and they work together to get out of this. They cover themselves in walker guts and find their way through the crowd. 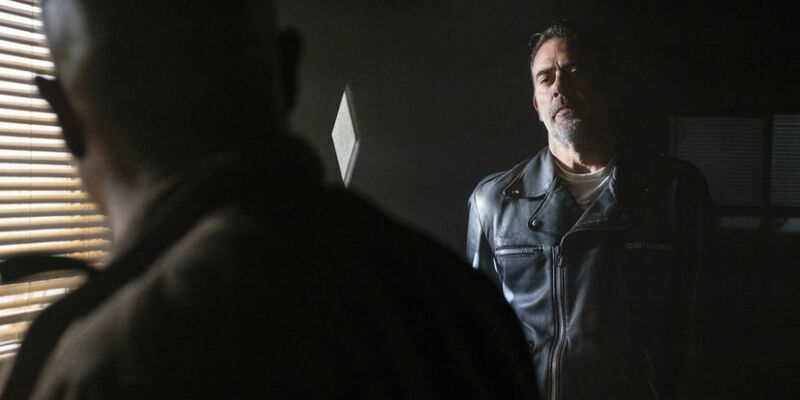 We had a chance to see some of Negan’s lieutenants trying to figure out what to do without him and how to ensure that the remaining Saviors make it out of this alive and still loyal to the group. Things get very interesting when one of his lieutenants brings up the fact that they have to have a mole within them since Rick’s group knew exactly when to hit Negan. Simon thinks that the mole is probably Eugene which makes sense since he was with Rick’s group for a long time (and Eugene gets why they think that too). Dwight is able to move the talk to something else, talking about a plan to get the Saviors out of the compound and a way to find Negan. The biggest problem that his lieutenants are facing right now is that there is unrest with the workers, but when Negan shows up he’s able to bring everyone back together again and when we hear one of his workers say “thank god for you Negan”, Gabriel sees exactly what Negan was talking about when they were locked up together. The big cliffhanger of the night is when Eugene checks on Gabriel and sees that he’s sick and when Gabriel asks Eugene to get Maggie’s doctor out of the compound we start to think that maybe Gabriel is going to infect everyone and take down the Saviors in a way we never saw coming! This season has been sorely missing the character driven episodes where we have just one or two characters in conversation or dealing with a situation. It’s been all gun fire, war and chaos, so this episode is something that we’ve been yearning for all season. Also, is there anyone else out there getting annoyed with the fact that the walkers have become background noise and are no longer threats to anyone? We get that over time these people would adapt to living with the walkers but they should be non-threats any more that people can mostly just move around. Mutate them please! What did you think of tonight’s episode of The Walking Dead? Leave us a comment in the box below with your thoughts. If you want to know what’s coming up next time on The Walking Dead then head on over to the link here where you can get a preview for the next new episode. 1. A small peek in to Negan’s soul. I would like to know more about his background. The wife story was good but can’t be the only reason he has been so tough. 2. The helicopter for sure. 3. What will Eugene do about his hunch that Dwight is the mole? 4. How ill is Father Gabriel and what are the consequences? I don’t understand why TWD has continued to senselessly be hated on, no matter what it does. The big name critics just trash the crap out of it, very disheartening.